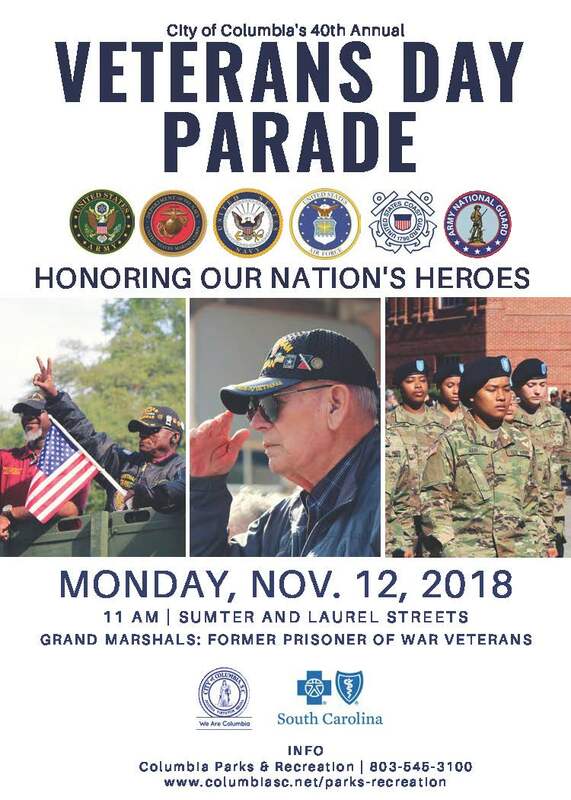 Veterans Day Parade City of Columbia - Nov 12, 2018 - Partners - Columbia Chamber of Commerce ? one of the Southeast’s largest Veterans Day parades. RAIN OR SHINE...The Veterans Day Parade will take place. Bring your umbrella and come help us honor those who served and who serve our great country. See you at 11am. The Veterans Day Parade will be held on Monday, November 12. The parade begins at 11 a.m. at the intersection of Sumter and Laurel streets, and travels southbound on Sumter Street, ending at Pendleton Street near the State House. Free. Parade participants must be registered through the City of Columbia.